I love the crown hair charm. As soon as my hair grows out a little more, I will be rocking this! My favorite color and so much sass! Every girl needs a shell in her locs! This one is PERFECT!!! Really funky and fun and super cute! I launched Accented Glory in 2013 with my three daughters, Deseré, Cierra, and Gabrielle. Deseré is our public relations guru and social media manager. Cierra writes for our blog, Accessory Diva, and Gabrielle is our design model. As you can see, it's a family affair! We are all naturals and before launching Accented Glory, noticed that hair accessories in retail stores catered to a much younger demographic and were not natural hair friendly. This void inspired us to create a brand that offers hair accents for adult women, created with materials that minimize damage to textured hair, provides a comfortable wear, and endures natural hair care regimens. We choose fabrics and materials that don't cause friction with textured hair and that assist in maintaining healthy tresses. We test wear our designs to ensure they are not only stylish but comfy. We also minimize our use of adhesives and rubbers, knowing that oils used on natural hair have the potential to break these types of materials down. My daughters and I also co-manage Accented Glory Naturals, a Facebook group for women and men with natural hair. 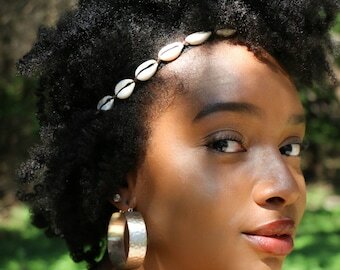 Our natural hair group is unique in that we share content beyond natural hairstyles and hair care tips - we share natural hair news, business, culture, and humor. We also host in-person and online events for our group members relating to natural hair. Hi! I'm Tonya, the visionary and accessory designer at Accented Glory. Accented Glory is a handcrafted women's fashion accessory brand that specializes in natural hair accessory and jewelry designs.